Cars with pedals exist—but have you seen a car that’s powered by pedalling? At Master Mechanic, we get excited about car customization and innovation. We we’re all intrigued when we saw what Saudi-based inventor, Nasser Al Shawaf, has been working on for the past few years. In tandem with a Dutch engineering firm, BPO, he has developed the world’s first calorie-burning car, that he hopes makes traffic-jams more productive. Think of a very advanced Fred Flintstone type vehicle. The current Fit Car is based on a stock Audi A4 Avant 2.0L petrol TFSI car, only there’s bike pedals in place of normal pedals. Just like riding a bike, if you want to go faster, you pedal faster. Simple, right? 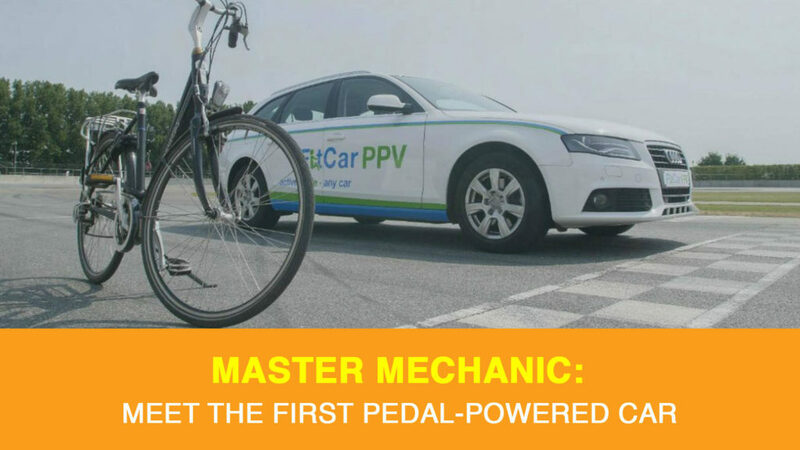 Next, the energy created by pedaling is converted into an electrical current, which is used to power the accelerator and help propel the vehicle forward. The first prototype the engineering team developed was using a Smart car. They designed and fit the stock frame with a rig that resembles like the bottom half of a small exercise bike. From there, engineers tweaked the car’s throttle controls to read signals sent from two spinning pedals instead of the single accelerator. Then they installed a hand-operated brake, and they were off to the races. With a concept that worked surprisingly well, they set out to tackle a larger vehicle that could appeal to the needs of North American drivers. They landed on the body of the Audi A4. To make room for the bicycle and flywheel mechanism they needed, the car’s brake pedal was replaced with a stock ‘push hand control’ system often used in mobility vehicles. This Fit Car might not appeal to many people, but there’s definitely a market for it. With many health experts saying sitting is the new smoking, we’ve seen many inventors tackle this issue. Doing its part, the Fit Car could help drivers burn up to 300 calories during a 30-minute commute. Being active in your car might come with the same health benefits of riding a bike—no surprise there—but how safe is it? By using existing systems, they were able to get the green light from the Dutch road safety authority, too. Upon inspection, they deemed the Fit Car completely street legal. Since the hand-operated brake is a standard retrofit for mobility cars, there weren’t many hurdles to overcome. Long term, the inventors hope automakers will manufacture their design for healthier cars. For now, only the Audi and Smart Car exist, so you’ll have to stick to traditional biking if you’re looking to get a workout while commuting. While we love learning about innovations in the automotive industry, your local Master Mechanic is always here to help maintain and repair your current vehicle. If you have any questions, concerns, or think it’s time to schedule an appointment, don’t hesitate to contact us!